When’s the last time you scheduled a furnace service visit with us? If it’s been a while, you’ll need to call our furnace contractors as soon as possible. Many of the furnace breakdowns we’ve seen could have been prevented by scheduling maintenance with our furnace contractors. Continue reading to learn how to prepare your furnace for cold weather so you won’t be without heat this winter. It’s not too late to schedule furnace maintenance! Hire one of our furnace contractors today. Did you know that routine furnace maintenance saves you money in the long run? 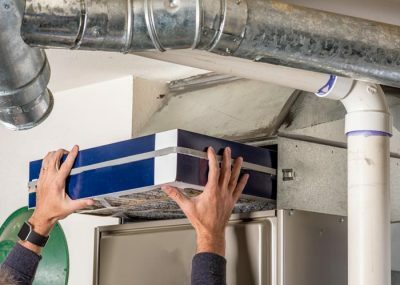 Furnace maintenance gives one of our contractors the chance to spot small damage before it turns into an expensive repair on the coldest day of the year. The cost of furnace maintenance is typically less than what it would cost for an emergency furnace repair or furnace replacement. The furnace filter is responsible for trapping allergens like dust, dirt, pollen, and pet hair. Over time, the furnace filter becomes full and will need to be replaced. We recommend you replace furnace filters every 3 to 12 months depending on the type of filter your furnace uses. One of our furnace contractors will also be able to replace the furnace filter during their service visit so your furnace will be ready for cold weather. A clogged filter can make it difficult for air to pass through, which makes your furnace work harder to produce the same amount of heat. When your furnace is forced to work harder and use more energy, it can decrease the lifespan of the unit. Knowing how to program thermostats for winter can save you money on energy bills. In the winter, you’ll want to set the programmable thermostat for as low as is comfortable for maximum energy savings. You’ll also want to program the temperature to be lower when there’s no one at home, like when you and the family are on vacation. There’s no reason for your furnace to work as hard when there’s no one at home to enjoy the heat. However, we recommend keeping the temperature above 55 degrees Fahrenheit to prevent your pipes from freezing. In other words, change the thermostat to reflect the seasonal temperatures outside and your schedule. Following our simple furnace maintenance tips can help extend the life of your heating system. If you’ve rearranged furniture since the last winter, you’ll want to make sure you’re not blocking registers, radiators, and baseboard heaters. It’s not uncommon for us to get a call from a customer about a cold living room, only for them to realize later that the couch was blocking the radiator. Heavy curtains can also obstruct the flow of heated air, making your rooms feel colder. Also, make sure that all your air vents are open before the start of the heating season. Our furnace contractors in Michigan are dedicated to helping you keep your home warm and comfortable during the winter months. If you are interested in scheduling furnace maintenance, call Parker-Arntz Plumbing & Heating Inc at (888) 641-3907.